I don’t always open my Florida Power & Light Company (FPL) e-newsletter each month. This time, I couldn’t click fast enough. If you’re looking for some unique benefit auction item ideas, that’s one! 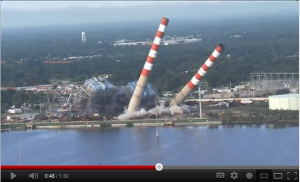 Imagine, the chance to watch — live — the destruction of the plant in a nearby (but protected) area. Maybe even the chance to walk around the grounds with FPL execs after the big blow-up. A demolition of almost anything can be a great item to sell in your next auction. Something about explosions and the destruction of big man-made things … the process of which appears to happen in slow-motion … are fun to watch. Because these events don’t seem to happen often, they attract gawkers. Here are some similar types of activities that might be taking place in your part of the world. Your local fire department will be burning an abandoned home as a practice drill. A bridge is being destroyed to make way for a new one. A ship is being sunk. Keep your ears and eyes open for announcements like these in your local paper. The bringing down of a structure in your neighborhood could be just the ticket to get your bidders hands up at your next auction. Sherry, an awesome idea! So true, people do like to watch these sorts of things. I am always insprired by your creativity! What a novel idea. Sherry, I love your creative, outside the box thinking when it comes to engaging supporters. This is a very fun idea and could also be used as a free special “insiders” event for long-time or multi-year major gifts supporters. And Lori, I totally agree with you. These types of activities could easily be used for “insider” opportunities for big-time donors, as you suggest. Awesome idea!! And I bet people would bid and pay big money to watch ringside while something blows up! Thanks for the fabulous idea Sherry!